Every once in a while a product comes along that, from all appearances, seems altogether poorly conceived and ill-designed, but later proves to be otherwise in my tests – leaving me pleasantly surprised. Unfortunately the TwitterPeek does not fall into this camp. Sometimes you really can judge a book by its cover, and this one is badly torn and missing a few chapters. At first blush the Twitter Peek looks like a badly designed and functionally decrepit device – which is exactly what is. I've been using this product for the past two weeks and have to say it without doubt one of the most abysmal new products I have used in a long time. And that is a heavy indictment. Here's why. First, let me lead into this review stating that while I find single-purpose devices to be more or less irrelevant in an age of multi-tasking smartphones and gadgets that perform just about any given task, I am not entirely apposed to the idea a product that does just one thing really well. But therein lies the catch – it must serve the role for which it was designed incredibly well, and with great ease and innovation. In the TwitterPeek's case, it delivers on it's Raison d'être in the worst possible ways. Let's start with the device itself. From a design standpoint it's something of an ugly duckling; awkward to hold and operate. Borrowing a few queues from the ever popular Blackberry, utilizing a traditional fixed QWERTY keyboard in a familiar form factor. But the design is more reminiscent of a Pop Tart than a Blackberry Curve, and it's all-the-more inconvenient to use. The keys are too small, making typing a challenge – unless you enjoy depressing keys using the corners of your thumbnails. A jog dial provides the basic means of navigating your way through the built-in software – only problem is, being right-handed, I tend to hold the device in my LEFT hand and operate its features using my right. Yet the jog dial is thoughtlessly located on the right side, forcing me to hold the device in the wrong hand. Frustrating. I can overlook the hardware complaints, being a matter of personal taste, but the steak driven into the heart of this product is its software. 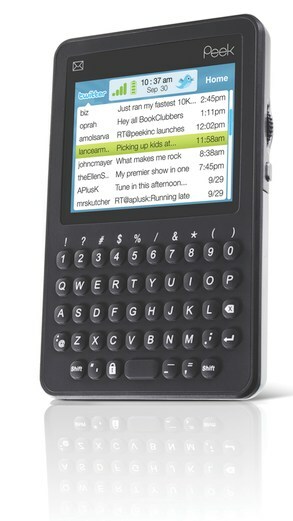 The interface is based on Peek Inc's previous product, born in the form an e-mail device. TwitterPeek shares the same software, right down to it's insane UI. When one thinks of a Twitter client, your mind conjures images of rich desktop client apps like Tweetie or Twitterific for Mac, Tweetdeck perhaps. All of which display tweets in a graphically sleek UI with large avatars and chat bubbles representing users and messages they tweet. Nope, not here. Instead TwitterPeek displays lists of recent tweets as just that – a list. In fact it doesn't even display the message body of individual tweets, forcing you to open them in order to read their contents. In exactly the same manner you interact with e-mail on a mobile device. And that's no accident, as this device is based straight off of its e-mail-centric cousin. This UI isn't simply lacking polish, it's functionally retarded – making even the simple act of viewing tweets (the device's sole intended purpose) all but impossible. Looking at the screen it's excruciatingly difficult even to distinguish your OWN tweets from the people you follow, which are lost among a list of obscure truncated usernames. It gets worse. An annoying bird-like chirp notifies you of the arrival of new tweets. You open a tweet by way of the jog dial, scrolling up/down to your tweet of choice among in the list, and depressing the dial – which then toggles a popup menu. Click "View tweet" to select and open your tweet. Sound like a lot of unnecessary work to perform a simple task? You're paying attention, because that's exactly what it is. It goes on. One of the most common uses for Twitter is sharing links to cool or otherwise interesting stories with your followers. Being such a vital function, you wouldn't think to even ask if this product supports HTML or offers a built-in web browser. But the answer to both is NO. Instead of displaying web pages, clicking a link presents you instead with a hideous screen of cryptic text – as TwitterPeek runs HTML through a paper shredder and spits out raw text. Who needs the mobile internet anyway, right? And if these encumbrances weren't reason enough to bail, there is the basic operation of the device, which performs incredibly sluggish. As in molasses poured through a sieve. Just scrolling through your list of tweets is mind-numbingly slow in responsiveness. Your scrolls register moments after movement of the jog dial. Yes, it's THAT bad. I could go on and on (more so than I have) regarding this product's lengthy shortcomings, but my above description pretty much sums up this device in one swipe. It's a dud. TwitterPeek is available for the low price of $99, which buys you just 6 months of service (this is a cellular device after all). A lifetime contract, which I predict to be short (spanning life of the company, not yours), is available for $199. I can't say whom the target market for this product is, save for teenagers perhaps. But with teens already carrying mobile phones capable of browsing the web, e-mail, instant message, SMS, etc., it's hard to see where this fits into their pockets. And I can't envision any teen placing this device on their Christmas lists this year. Nor would I recommend it.